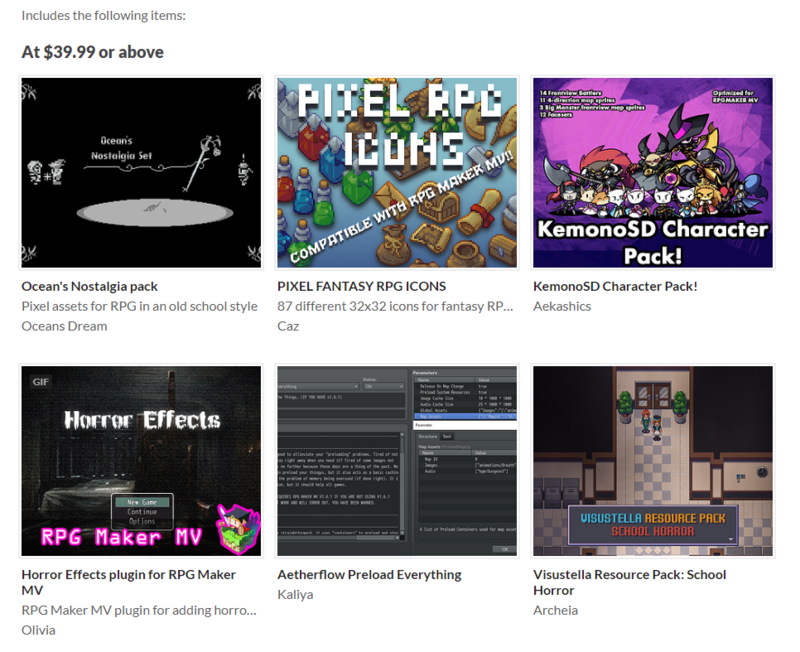 Our talented content creators from the RPG Maker community are creating an assets bundle for Black Friday, which you can purchase at a massive discount and use for your RPG Maker game(s)! There’s three different bundle types, for game devs with different budgets! Don’t worry, they’re all thinking of you, too, as they made these bundles! Archeia’s School Horror resource pack! Ever wanted to create a horror game with a school setting? Or do you want to use them for a dating sim? The choice is yours! Olivia’s Horror Effects plugin! Create spooky, glitchy effects for your RPG Maker project using this plugin. From noise to TV lines to glitchy graphics, put your players at the edge of their seats before you blow their mind. Kaliya’s Preload Everything! 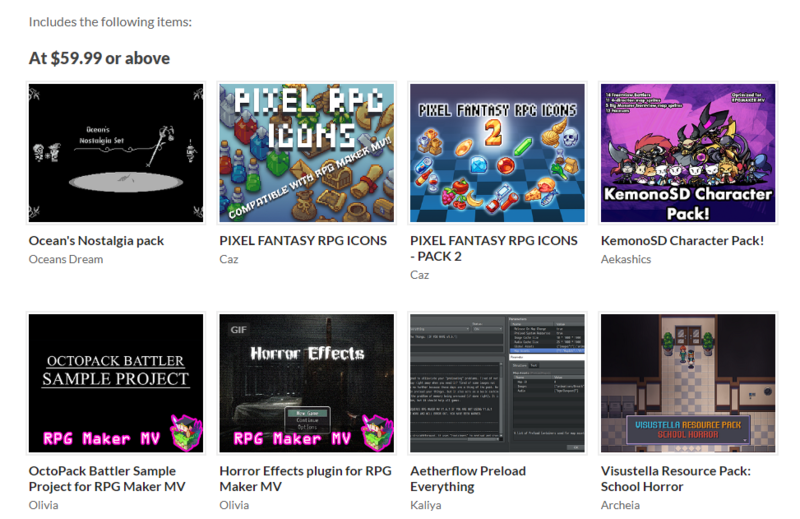 You can’t have a horror game or dating sim without some custom graphics, and what a better way to load up those custom graphics than with Kaliya’s Preloader? These three assets will definitely work hand-in-hand in helping you create the horror experience or dating sim you want! The original price of everything together used to be $30, but now you can save a chunk of it by buying it altogether for only $20! Click here to view the Silver Bundle! Caz’s Pixel Fantasy RPG Icons! Why not sprinkle it up with some adorable and gorgeous icons made from Caz? These icons can be used for a variety of games! Ocean’s Nostalgia Pack! Make your players put on some nostalgia-tinted goggles with Ocean’s Nostalgia pack featuring very lovely pixel art and a blast to the past! Aekashics’ Kemono SD Character Pack! Perhaps you’d like to try to make a different type of game with a different type of cast. Aekashics has a bunch of cute and sugary animal-eared friends with the Kemono SD Character Pack! The original price of everything together used to be $65, but now you can save a chunk of it by buying it altogether for only $39.99! Click here to view the Gold Bundle! Caz’s Pixel Fantasy RPG Icons 2! And if you didn’t have enough of those beautiful icons, Caz has even more for in her second pack! Olivia’s OctoPack Battler Sample Project! And if you’re gonna be making an RPG, may as well get the best turn-based battle system available for RPG Maker MV with Olivia’s OctoPack Battler! The original price of everything together used to be $105, but now you can save a chunk of it by buying it altogether for only $59.99! Click here to view the Diamond Bundle! These bundles will be available until the end of November 30th! Be sure to check them out and grab whichever one fits you the best! ← Newly Released: Horror/School Tilesets + Kemono SD Volume 2!